The fallout from my heinous last eight months of deciding to move and then renovating, selling, designing a new place, passports, MOVING, storage units, motels, wedding, Mexico, etc. etc., etc. was that it is now the second week of November and I’m still trying to recover physically and just flat cratered on a lot of stuff for The Pour Fool. The latest casualty of our Mad Scramble was two absolutely, shockingly brilliant beers from my pals at Deschutes, the immortal Hop Trip and this year’s other fresh-hopped addition, Chasin’ Freshies Fresh Hop IPA. Do ya like beer? GET THESE. And I have no comeback. I’m sorry. Jesus, Mary, and Joseph and Eddie and Harold, I have no excuse except exhaustion. As readers of this incoherent bloglet will attest, I’m a terrible and unabashed Deschutes fan boy…hell, I may be Deschutes Fan Boy Numero Uno, I dunno. But I can honestly state that the reason is, out of the maybe 100 beers I’ve tasted from those folks on Simpson Avenue in Bend, I’ve had ONE that I sorta didn’t care for. And I even sat and drank and enjoyed that. So it will come as no surprise that I’m saying that this 2015 Hop Trip and Chasin’ Freshies Fresh Hop IPA are, uh, indispensable, if you’re a beer fan and have working palate. 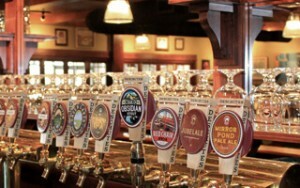 Deschutes Hop Trip is just flat-out the best fresh-hopped ale made in America. Period. I don’t even discuss it, anymore. In a bottle, it’s spectacular. On tap(! )…you may well see stars, unicorns, dead relatives, and Jimmy Hoffa. There are two reasons for this: 1) They’re arguably America’s best brewery. 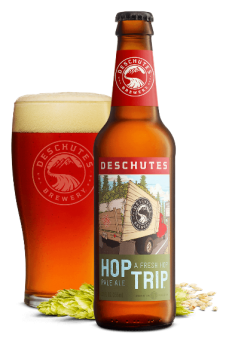 An objective list that’s not eaten up with trendiness and “buzz” has to have them listed at least in any Top Ten and 2) If the term “fresh hopped” means anything at all, Deschutes does America’s best job of getting hops from field to tank to bottle. They’re located less than three hours drive from their source, Doug Weathers’ farm just outside Salem, Oregon. They drive a BIG truck over, filled with empty bins, wait while the hops are picked, and drive back with full bins, which are then dumped straight into a tank. Brewing is underway within five hours. I read about a fresh-hopped ale being made in North Carolina, the other day, with hops flown in from Yakima. NOT the same animal. Fresh-picked, dripping with resins, aromatic as a day at Hempfest in the Olympic National Forest, and so sticky they clump together in the bins…versus a truck trip to Spokane or Seattle six hours in flight, several hours getting to this brewery? Nah. Give Me Hop Trip or Give Me…well, some other type of beer. 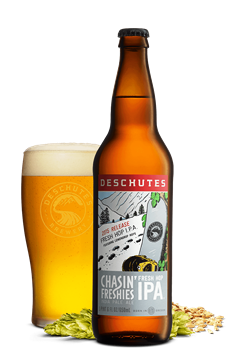 Deschutes Chasin’ Freshies Fresh Hop IPA is a different breed of cat, altogether. The titular freshness of the original Chasin’ is present, in an intense and forthright way but, in this version, is enhanced by a liberal dose of the new and stunning Lemondrop hops, a hybrid flower developed by Yakima’s brilliant HopSteiner. It’s an aroma varietal that was created from a cross between Cascade and USDA 19058 male. 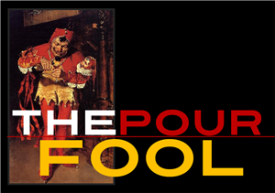 Readers of The Pour Fool initially read of this newcomer in my review of its first large-scale use, from this post from the Seattle P-I version of The Pour Fool, a review of the 2013 Hop Henge Experimental IPA, posted on December 14th of ’13. At the time, it was just going by a number but then-brewmaster Cam O’Connor told me, “The experimental hops used in Hop Henge are a numbered variety and are still in development. The other hops were Millenium, Cascade, Centennial and Chinook. 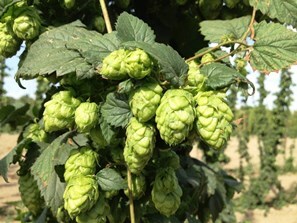 The experimental hops we used in Hop Henge came from one of the hop dealer/brokers in Yakima. They have breeding programs aimed at developing new varieties for the brewing industry.” A week later, William Elkins of HopSteiner contacted me to let the name, uh, drop.